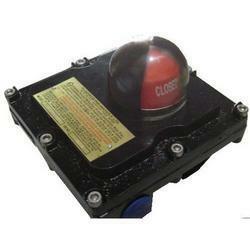 Prominent & Leading Manufacturer from Thane, we offer limit switch box. Limit Switch Boxes are available in weatherproof and Flameproof (CMRI Approved) Version. Robust Construction and high quality of electronic material used in manufacturing of the limit switch boxes ensures long life. Advanced range of Valve Limit switch box- both in weatherproof and Flameproof versions. Attractive Aluminium Die-cast housing - powder coated. Colour coded Cams for opening and closing. Shatterproof Dome made of Polycarbonate. Special PCB eliminates all wiring. Fluid tech offers Weatherproof and Flameproof Limit Switch boxes with PCB inside - wire free design. A limit switch box is mounted on and coupled to the actuator in order to operate position-indicating lights on control panels; to control other equipment such as pumps, compressors and mixers; to sequence other valves, or for feedback and PLC position confirmation. Two single pole double throw (SPDT) switches are mounted in one enclosure and are activated by individual, adjustable cams. The limit switch box is available in weatherproof / enclosures, and switches can be supplied in mechanical or proximity models.